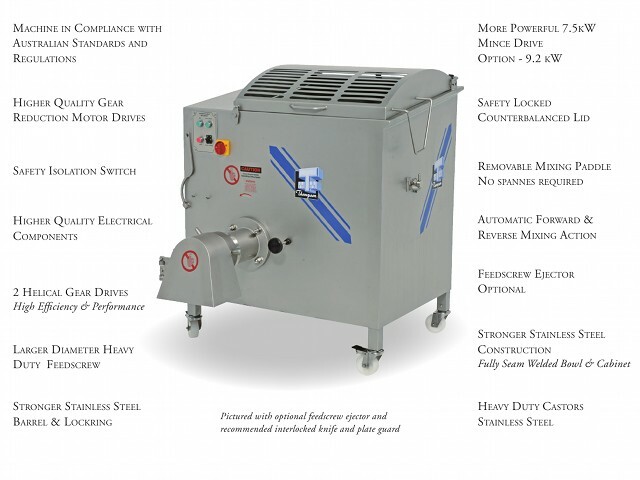 The Thompson 3000 Mixer Mincer is the most robust, heavy duty 120kg Mixer Mincer manufactured in Australia. The Best Value for Money 120kg Mixer Mincer available in Australia when you consider quality, construction, components, design and attributes of the Thompson 3000 Mixer Mincer. The Thompson 3000 Mixer Mincer is constructed from heavy gauge Stainless Steel including Stainless Steel feedscrew and paddle. It is fully seam welded inside and outside and finished with smooth hygienic surfaces in an appealing satin finish to achieve clean bowl on product discharge. Removable Stainless Steel Mixing Paddle ensures easy and thorough cleaning providing maximum hygiene. The unique design feedscrew channel with right angle mixing paddle that feeds and delivers continuously to provide Efficient Mince and Product Discharge with a High Definition meat particle and cut quality. The Thompson 3000 Mixer Mincer is powered by 2 independent HELICAL gear reduction units and designed to deliver strength and reliability for many years. The Reciprocating Mixing Action efficiently yet gently blends fat and lean product into homogenous batches. This guarantees product consistency. The Thompson 3000 Mixer Mincer is designed to offer high capacity production in a compact size. Supermarkets, butcher shops and quality processing facilities will appreciate the performance of the Thompson 3000 Mixer Mincer. It is built to withstand the high demands of larger production.